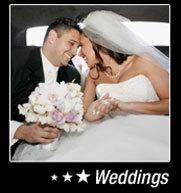 Our wedding packages can be tailored to your specific needs. Our wedding specialist will make sure we have covered every detail to ensure that special day's travel is seamless. Our HUMMER which includes the bride option is capable of handling your bridal party and features all the amenities desired in a wedding limousine. We also offer our 10 passenger white stretch limousines for that special occasion.